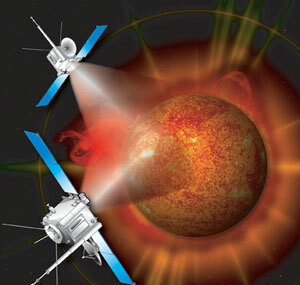 The primary goal of the Sun Earth Connection Coronal and Heliospheric Investigation (SECCHI), a component of the Solar Terrestrial Relations Observatory (STEREO) mission, is to advance the understanding of the three-dimensional structure of the Sun's corona, especially regarding the origin of coronal mass ejections (CMEs), their evolution in the interplanetary medium, and the dynamic coupling between CMEs and the Earth environment. Other sites of interest are listed here. As ever, I have no control of the content of external sites. Home The main index page. JET-X Joint-European Telescope for X-Ray Astronomy. Project information pages. SMEI Solar Mass Ejection Imager. Project information pages. SMART-2 Gravity Wave Exploration. SECCHI Dual-Satellite Solar Observatory. DesignProject design information. OperationsMission control and operations. GallerySTEREO Picture Gallery.